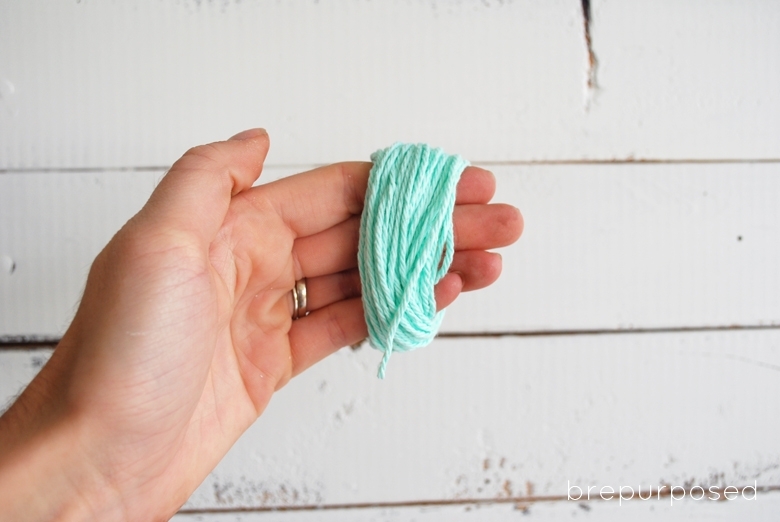 Wrap your yarn around your fingers multiple times. I went with 50. 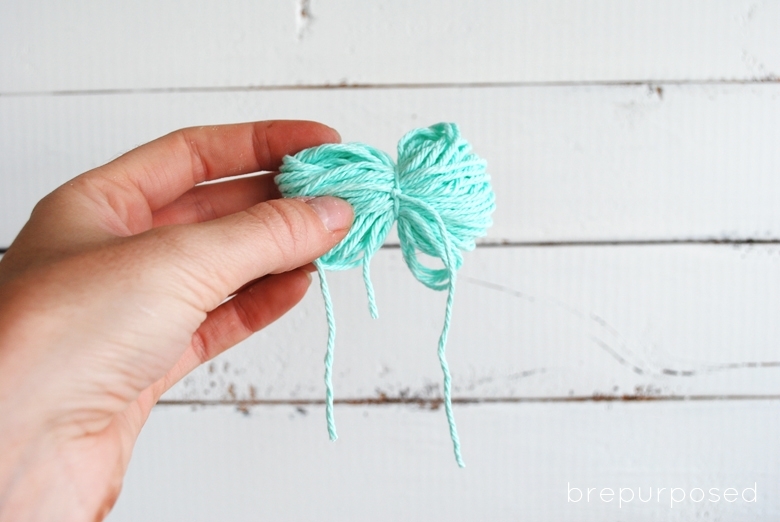 Cut your yarn when finished and cut an extra piece off that’s about 6 inches. 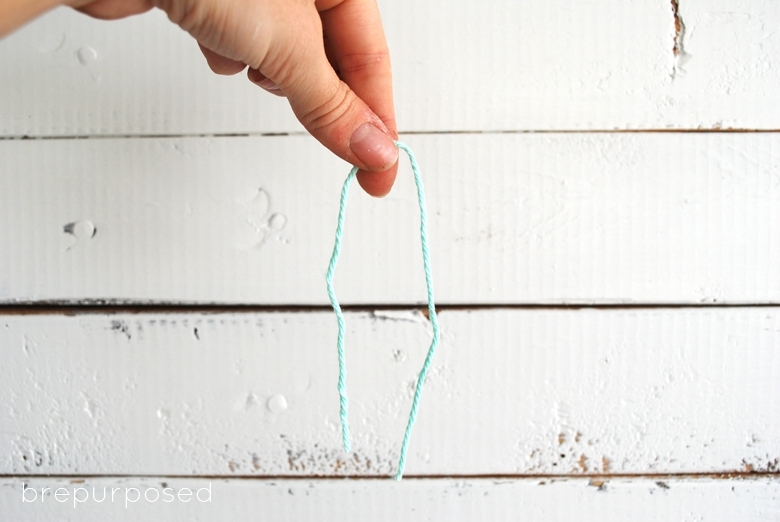 Slide the yarn off your fingers and tie the 6 inch piece around the middle tightly. 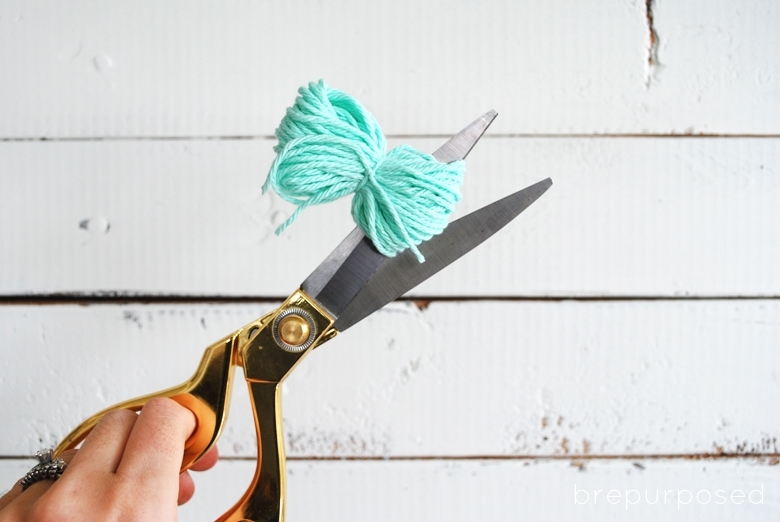 Trim the longer piece of yarn and then cut through the loops on either side. Now for the wood, I used a simple white wash (white paint mixed with some water) and brushed it on with a foam brush. I wiped off the excess and was left with an awesome weathered look. 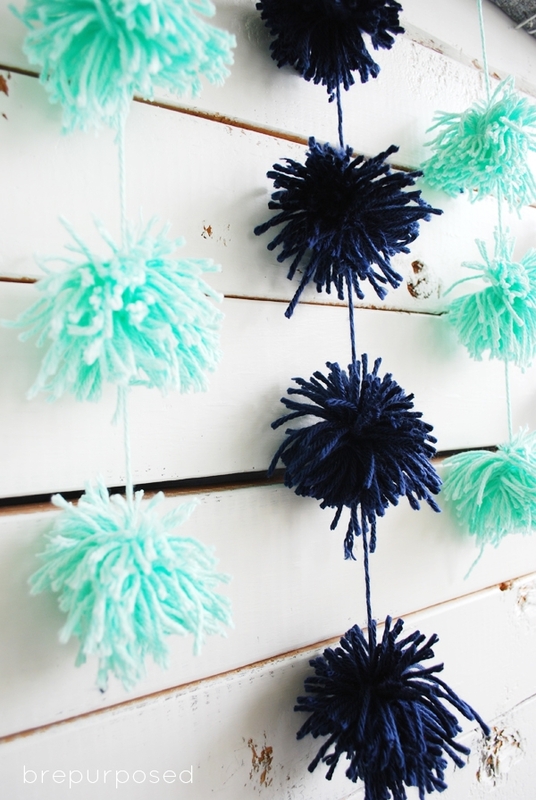 To hang the pom poms, I just used some extra yarn and tied pieces between each pom. 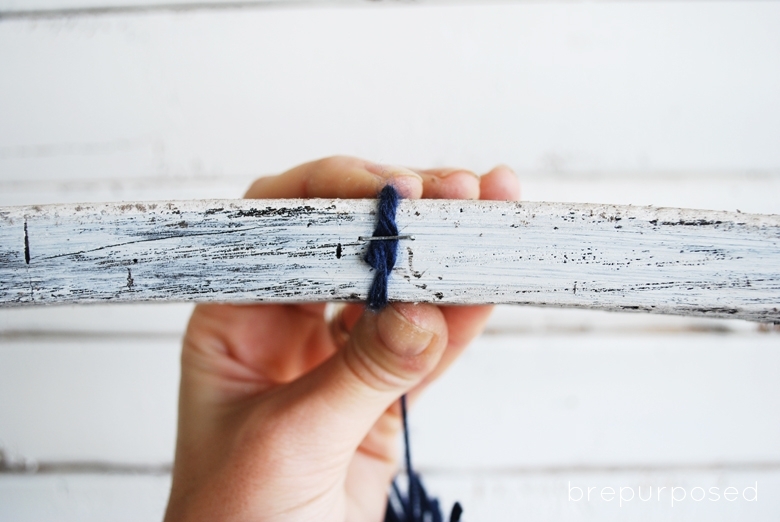 I wrapped the yarn around the wood twice and then stapled it to the back to keep it in the place. P.S. I’m sure you notice a little something different about my backdrop eh? I’ll be sharing all the details of the update I gave it soon! Don’t forget to check out all the other fabulous scrap wood projects below. Have a great day friends! 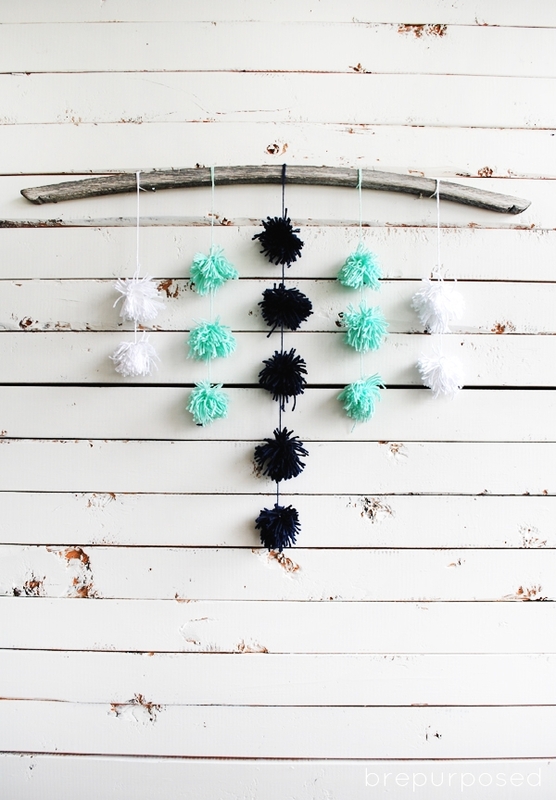 Love pom poms in general, and your wall hanging is gorgeous! You are so awesome! 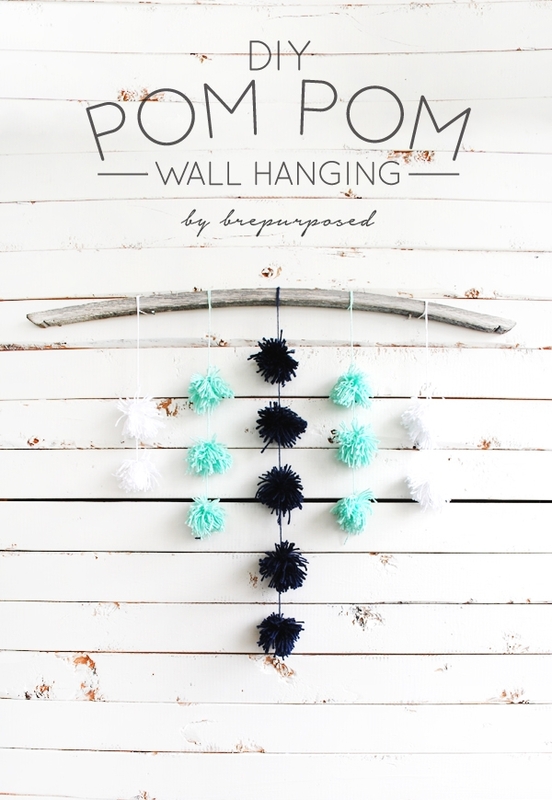 What a fun wall hanging. I’d love to see one of these in a kids room. 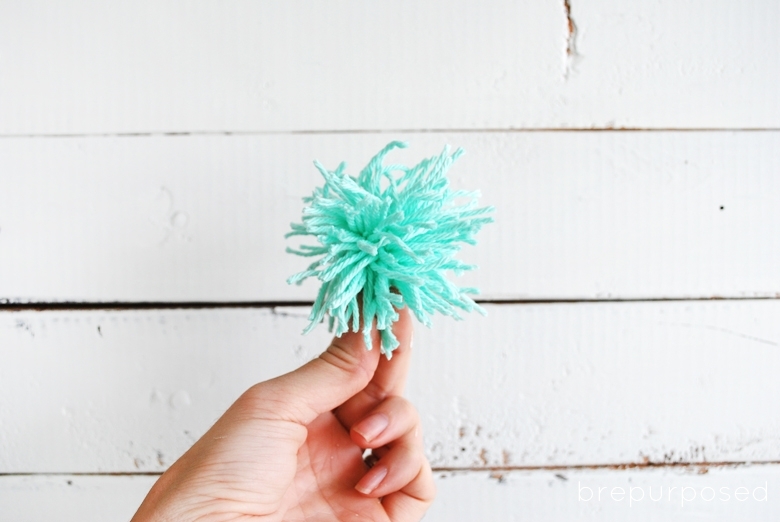 It would be such a fun pop of texture and color. Thanks girl! It would be perfect in a kiddo’s room for sure! Super cute, Bre! Love the colors! And I am loving your new backdrop! Hope you have a wonderful weekend! I really really love this! I want to make one for my daughter’s room and maybe mine too! Pinning!! Thanks girl! And you totally should, it was so easy and fun! Super cute, Bre! Perfect use for that piece of scrap wood! Three cheers for whitewash! looks great! 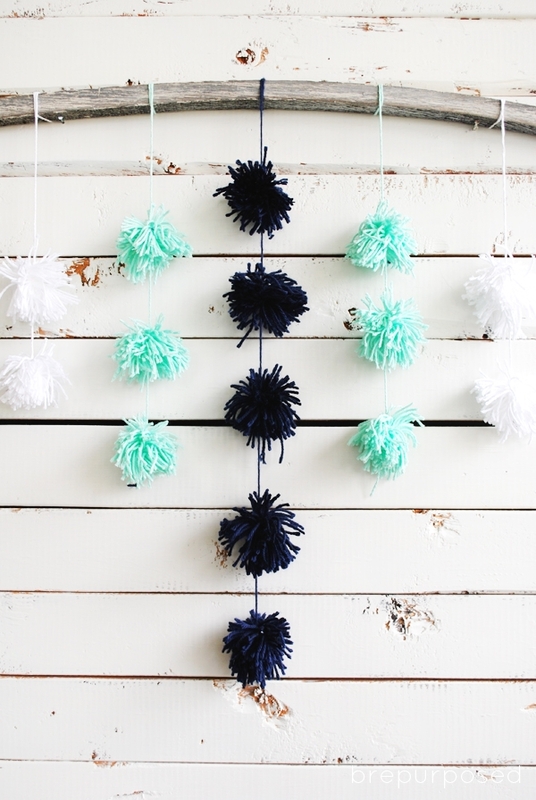 I love everything pom pom! This is so cute! Now I want to make a giant one to hang above the pink sofa in my office! 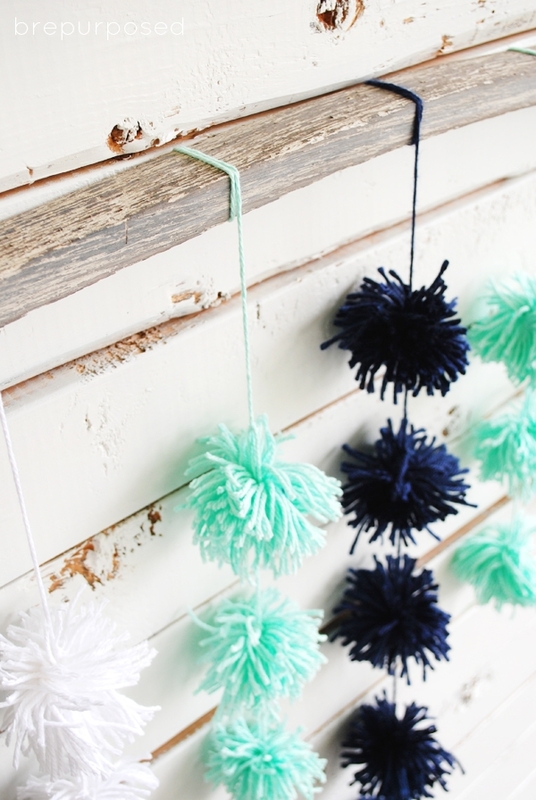 I had no idea pom poms were so easy to make! 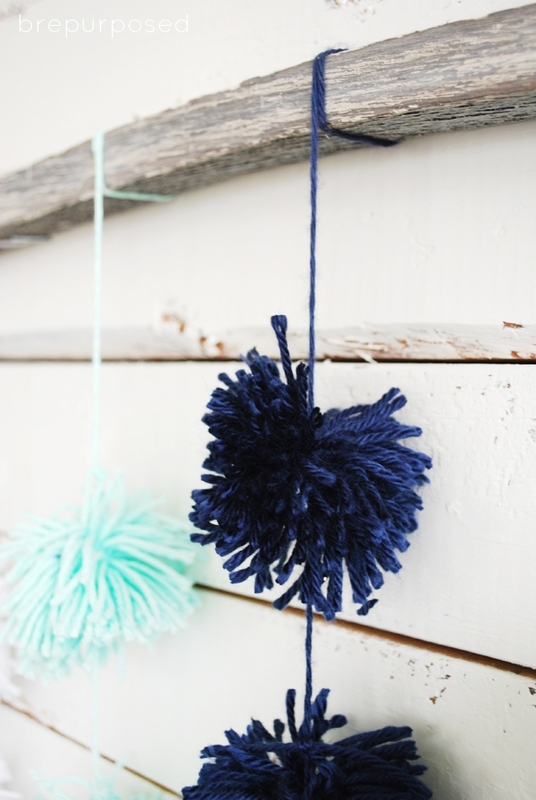 What a cute wall hanging! I love the color palette you went with for this, and it’s so beautiful and simple! My cats would destroy it in a heartbeat but ohhh I think this would be just darling in a nursery! I can’t seem to stay away from this color palette! It’s just too good. And Oaks (my pup) was definitely intrigued but luckily he can’t jump that high 😉 And yes to the nursery! CUTE! 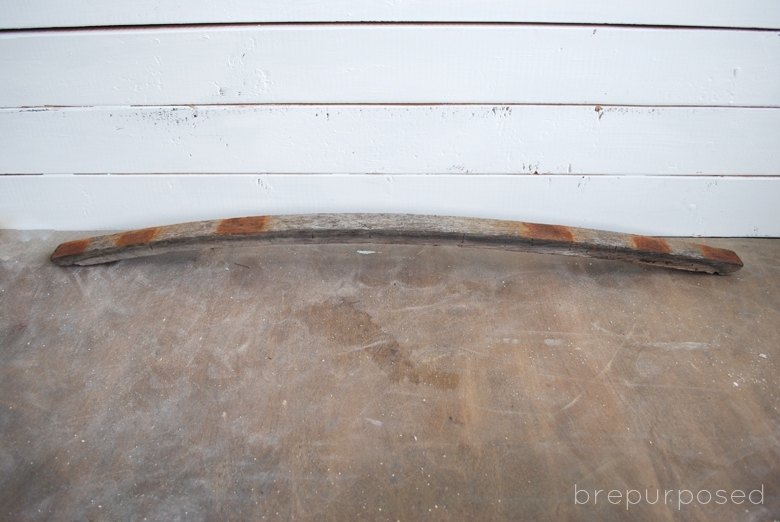 I love the curve of the wood. Goodness girl, this is CUTE. That scrapwood could not be more perfect- my luck has never been that good! This is so fun and such a perfect color combination! 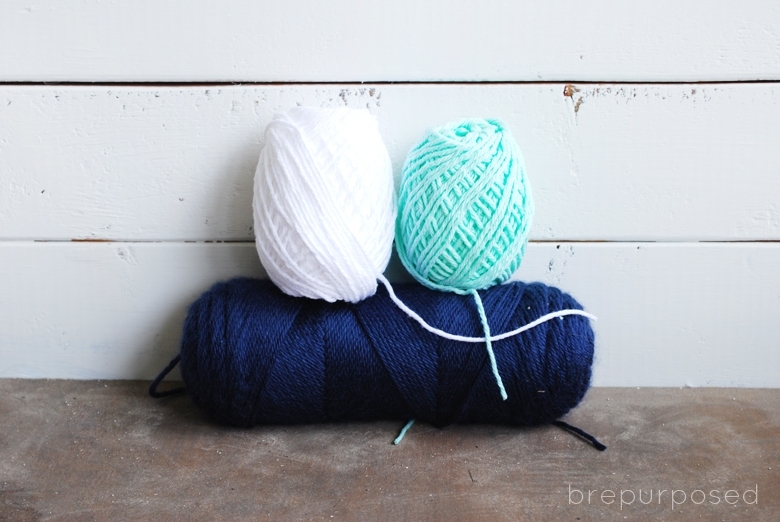 I just bought red, white and blue yarn for a Fourth of July project, but haven’t figured out what I’m doing with it yet. This totally inspires me! Ohh a red, white and blue one would be so fun!! This is just the cutest Bre! SUCH a fun way to use that fab wood! Aren’t they so fun?! And nope it’s the same backdrop, I just gave it a little update 😉 Keeping it outside is the way to go!